Tomorrow is the big day, everyone! The movie that has critics and fans so impassioned that they're getting banned from Rotten Tomatoes will finally arrive. Your sidekick has spent hours standing in line, dressed up as an old-school Robin, and he's starving. So get yourself into this awesome $18 Batman Apron, head out to the Bat-grill, and cook up some Bat-burgers to take over to the theater for a sidewalk picnic. 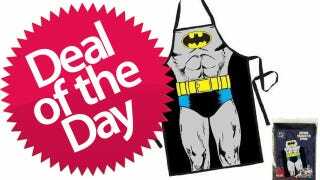 With this apron, long after the Dark Knight has risen, you'll still feel like a superhero in your kitchen. If a deal looks too good to be true, investigate the store and see if it's a good, reputable place to buy. Safe shopping! Dealzmodo is a gift from Gizmodo to you. We search the web for the best savings and deals on computers, TVs, games, etc. and deliver them to you in a daily list. Think of it as a modern day coupon book for technology and gadgets.